Hidden inside your walls and underneath your floors, rests an intricate plumbing system. And whether it’s your residence or a commercial building, you still need your essential clean water lines and proper sewer lines. Inaccurately functioning water lines will affect regular operations, pressure and temperatures or your plumbing fixtures- including, bathroom or kitchen faucets, showers or baths, garden sprinklers, restroom toilets, drains, etc. Plumbing has its own lingo and vocabulary. We will gladly educate and inform you on a plumbing diagnosis, service or repair that may include unfamiliar terms like “excavations”, “trenching”, installation of sewer and water lines, tubing, setting fittings and straps, bolts, connectors, pressure reducing valves, couplings, shutoff valves or blow-off valves, vaults, leak locator, testing, et cetera, et cetera, et cetera. Our licensed plumbers are well trained. 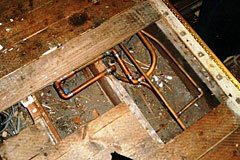 When it comes to dealing with all your plumbing needs, troubles, or surprises, contact E.Z. Roth Plumbing.